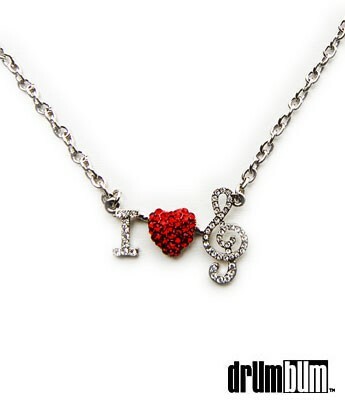 “I Love Music” Heart Necklace – Show off your passion for music with this dazzling piece of jewelry. The “I Love Music” Heart Necklace features a rhinestone encrusted pendant that spells out it’s name with the use of a heart and treble clef. Musicians everywhere will love to wear this beautiful necklace. This music gift is made of metal with a 24″ L adjustable chain. Music Jewelry AT DRUM BUM!